Hi, my name is Craig Philpott. I am from the Gold Coast, Queensland, Australia. 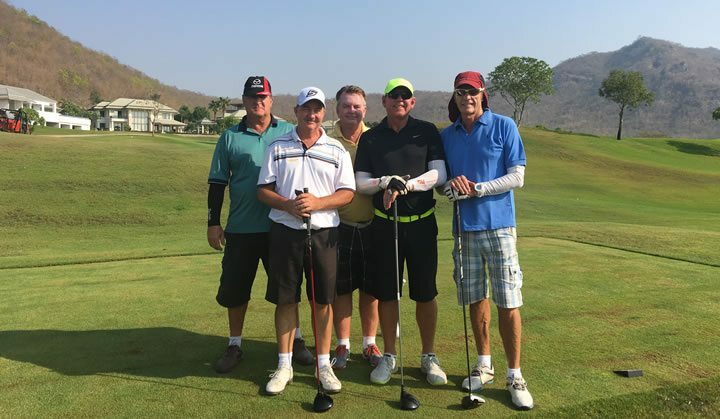 I travelled to Hua Hin with 4 mates from Nudgee Golf Club in Brisbane. I have played golf for approximately 30 years. My handicap is 4 at the moment. I am a member of Nudgee Golf Club in Brisbane. Nudgee is a members’ course but open to guests as well. This was my first time to Thailand. We selected Hua Hin so we could watch a member of our club, Scott Hend, play in the Thailand Classic, which he duly won so we now have to return next year! Three of the members on the trip have known Scott for quite a few years so this was a cause for much celebration. My first impression of Thailand was “how good is this”. We were picked up by Golfasian at Bangkok airport and transported straight to our hotel at Hua Hin in a very comfortable vehicle. Check-in was swift and I was in my room within 10 minutes of arrival. Next morning we enjoyed a very good breakfast before heading to the front of the hotel ready for golf. The Golfasian driver was waiting for us and we were on our way. We played Sea Pines first and I would recommend this course to anyone. It’s a very good course with great views out to sea on the first, second and the last few holes. Played Banyan and it was everything I had been told it would be. A course with everything, tight holes, wide open holes, trouble for the unwary but playable for all; also in very, very good condition. Springfield Royal was next. Due to the drought it was very dry, which meant not only were the fairways firm (although well grassed) but the large dams were dry. Tee blocks, fairways and greens were in remarkable condition considering the lack of rain the course has received over the past 2 years. I would love to play this course again once the rains return and replenish the water holes. Majestic was next and it also was quite dry once off the fairways. Very playable for all standards and an enjoyable course. Again, would like to play this course after rain as it would be a great test. The staff have done a great job to have it in the condition it was in. Black Mountain was the last course we planned and it was in absolutely great condition 4 days after the Thailand Classic. Not sure what I can say about this course apart from it was a privilege to play such a wonderful layout. Playing from the 7000 yard tees I somehow eagled the 18th, driver, 3 wood and a 3 metre downhill putt. Black Mountain rates in the top 6 courses I have played, sitting alongside the Palmer course in Hawaii, Cottesloe in Perth Western Australia, Royal Adelaide, Troon North in Scottsdale Arizona & Torrey Pines South course. We liked everything about the trip. Caddies were great; all very pleasant and very informative. It didn’t take long for them to work out our strengths and weaknesses. The price may be leaning towards the top of the scale but when everything is as well organised as this trip was it was well worth the money. Condition of the courses was fantastic when all is considered. Favourite course was Black Mountain but the others were very enjoyable. There were many favourite holes but due to my eagle the 18th at Black Mountain is at the top. The 14th & 15th at Springfield Royal would be great holes when the dam is full; what an awesome sight from the tee blocks. The 3rd & 18th at Banyan were great, 1st, 2nd, 16th, 17th & 18th at Sea Pines – fantastic. Majestic also had some great holes but I can’t remember which numbers. Weather was beautiful…couldn’t ask for better. One player had 38 stableford points one day which was the best in the group. My best was 34 at Sea Pines, maybe I was enjoying the courses too much to concentrate. The best day was the Thursday at Black Mountain. Everything about this day will be remembered for a very long time. After golf we did a little bit of site seeing but mostly visited restaurants and bars, checked out the markets and did some forward planning for our return which will be asap. Everyone we encountered was smiling and happy. Fantastic local people who were only too willing to chat and give us ideas on what to do. I’ve already recommended Golfasian to others and will continue to do so for anyone who wants a fantastic golf holiday in Asia. A huge thank you to Ian Morgan and his team in Hua Hin for a job well done.